From Jun.24 to Jun. 29, 2013, upon the invitation of Dr. Werner Magnes, Dr. WANG Jindong, Dr. ZHOU Bin and Mr. CHENG Bingjun from the Lab of Solar System Exploration, National Space Science Center (NSSC), paid a six-day visit to the Space Research Institute (Institut für Weltraumforschung, IWF), the Austrian Academy of Sciences in Graz. The delegation was warmly welcomed by Professor Wofgang Baumjohann, Director of IWF. 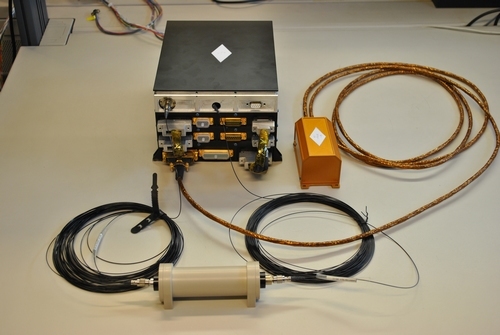 In the Electro-magnetic satellite mission, IWF was responsible for providing NSSC with a set of absolute scalar magnetometer for High Precision Magnetometer, named Couple Dark State Magnetometer (CDSM).In order to obtain scalar magnetic field data for the Fluxgate magnetometer (FGM) on orbit, NSSC and IWF scientists conducted electrical and mechanical tests on CDSM and FGM sections in Engineering Model during the visit. Cooperative memorandums concerning vital time node were also signed to ensure that CDSM can be delivered on schedule.